Cedar On 15 had one of the nicer decor I have seen, and I was especially intrigued by the ever changing lighting on top of where we sat. 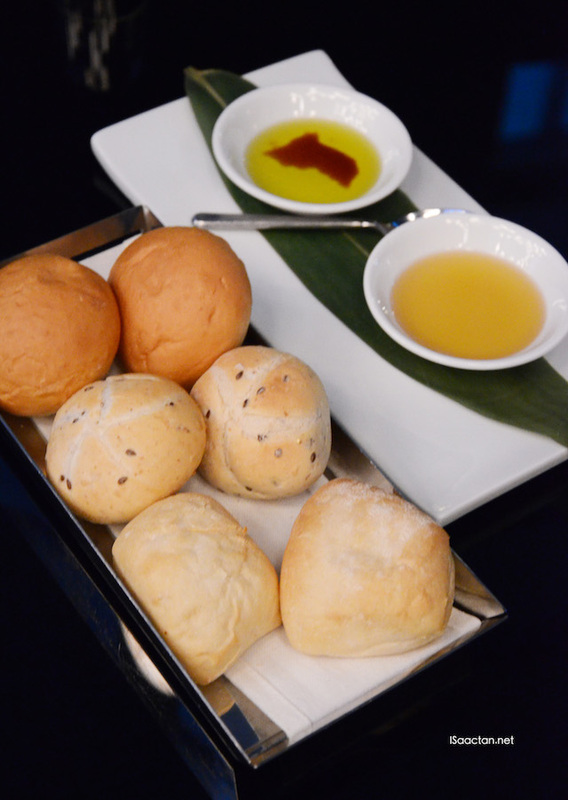 It's always good to be served with warm bread before the start of any meal, and at Cedar on 15 we had the really nice fluffy Assorted Bread Rolls with walnut oil and balsamic pomegranate vinaigrette. The dips were exotic enough to be different from my usual partaking. Best served with the accompanied Pomegranate Balsamic Vinegar, we had the rather huge Cedar Salad. 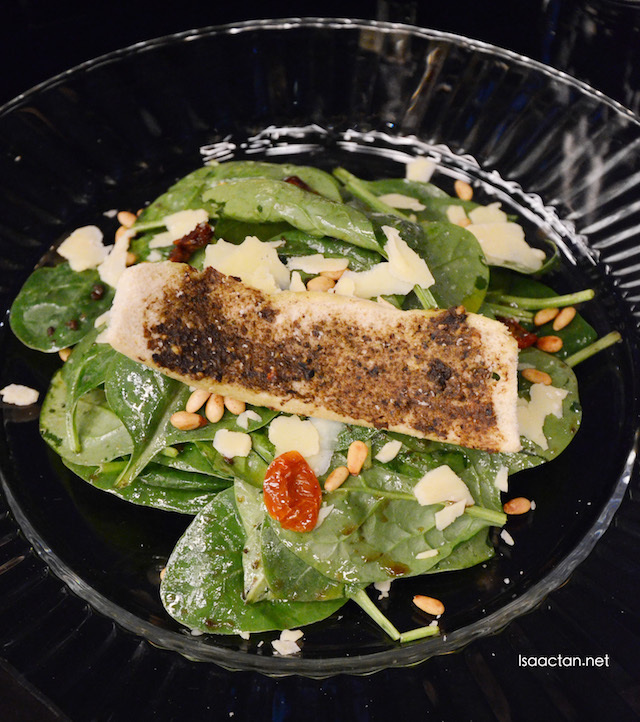 Consisting of Baby spinach with shaved Parmesan, toasted Pine Nuts & Mustard Walnut Vinaigrette, it's indeed a mouthful, but tastes just great in the mouth. Love the pine nuts and how they add crunch to the whole salad. Some cheese to whet your appetite? Try Cedar on 15's Fresh Burrata Cheese then, air flown from Italy served for your culinary delight. 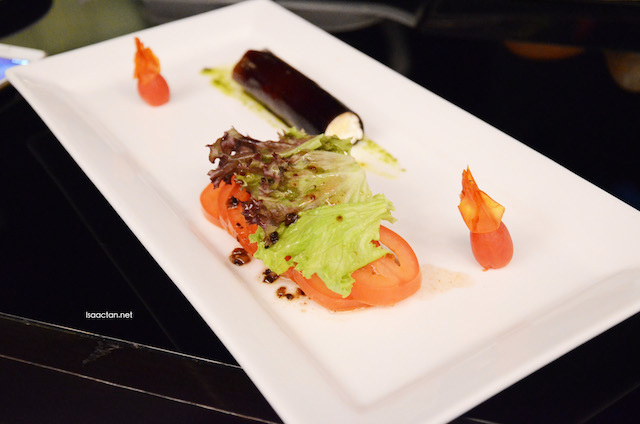 The cheese is wrapped with Balsamic Gelee, giving that delightful sourish sweet taste, served with Roma tomatoes and extra virgin olive oil. I find the cheese to be really nice, not too overpowering, fresh and soft to the taste. 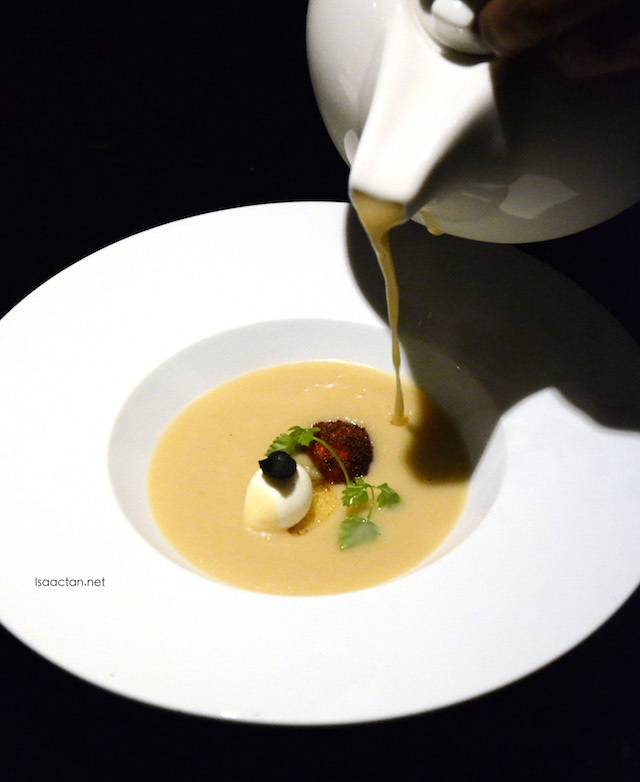 We had the soup next, with the first being the Cream Of Topin Ambour with Truffle Oil and Bocconcini Cheese. 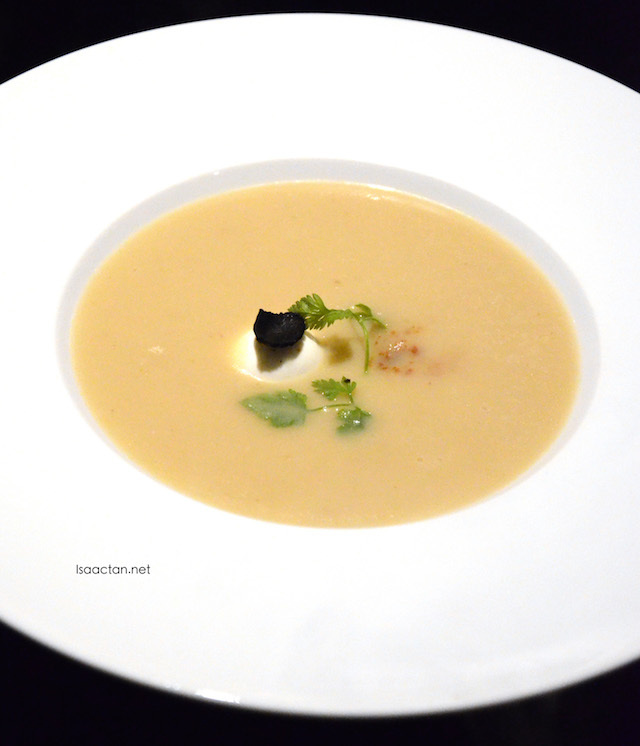 Thick and creamy, the hint of truffle really changes the whole dining experience. Luxury in liquid form, we enjoyed the soup, before moving on to our main courses. Now I've always liked cod fish due to its soft and flakey texture. Here at Cedar on 15, their Pumpkin seed crusted Black Cod is perfection on a plate. 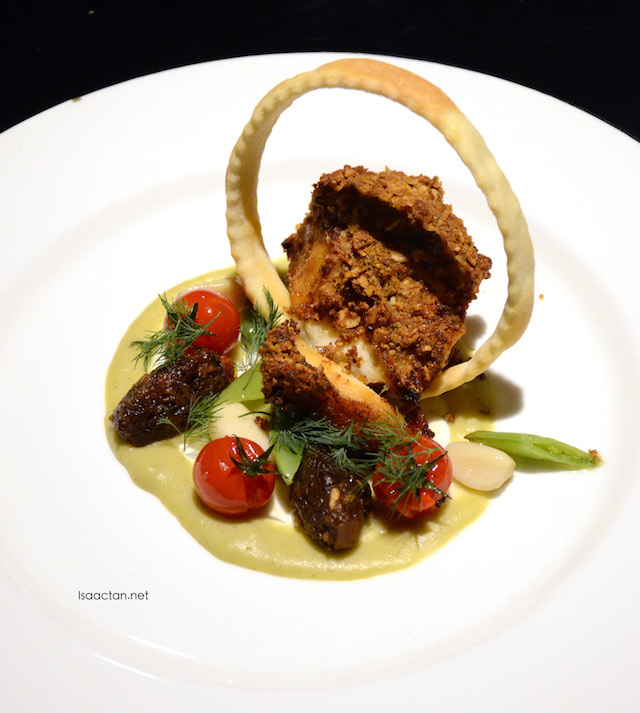 It was a delight to stare at too, served with colourful mushroom tomato chutney, fennel mousse, and sugar pea snap. Drizzled with hazel nut sauce, the fish cooked just nice, without being too dry, flaking off with a slice of our fork. Good stuff. My favourite meat, the wagyu beef was served next. 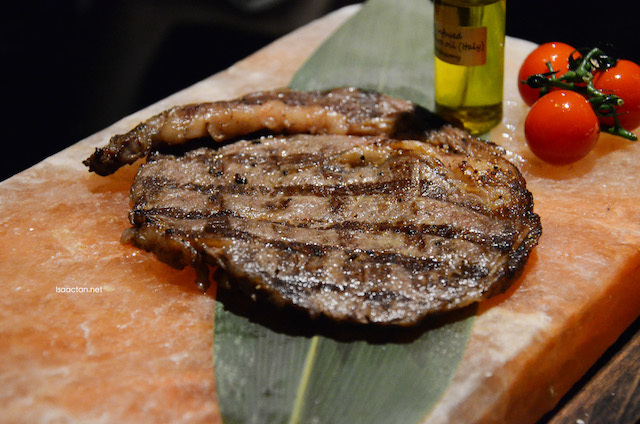 Wagyu Ribeye on Himalayan Rock Salt is prepared and cooked on a pre-heated rock salt slab that adds fun to the meal. Cedar on 15 recommends that the Wagyu beef is cooked in the purest and natural form which is on Himalayan Rock Salt in order to enjoy the freshness. The Himalayan Rock Salt slabs are permanently heated in the oven. This method of cooking will lower blood pressure as no cooking oil is used. 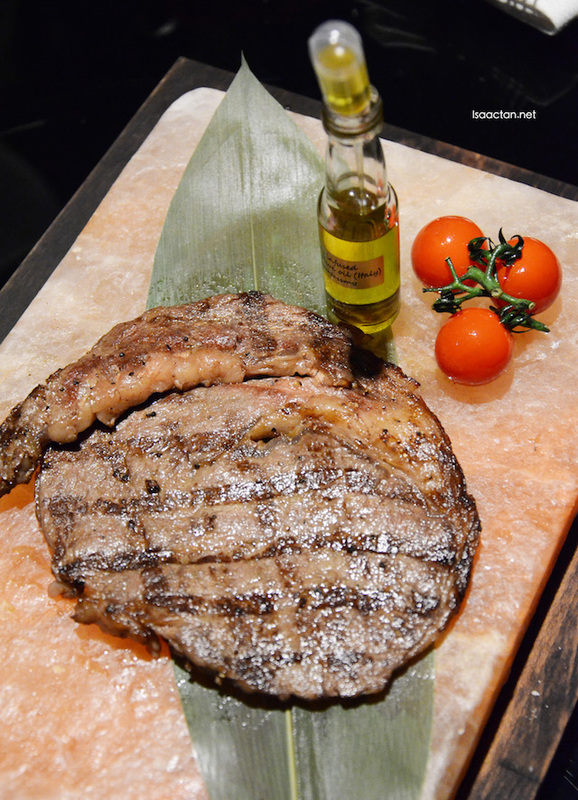 It is recommended that the Wagyu Beef is placed on the rock salt slab for five minutes. The meat will absorb more saltiness if left longer on the rock salt slab. 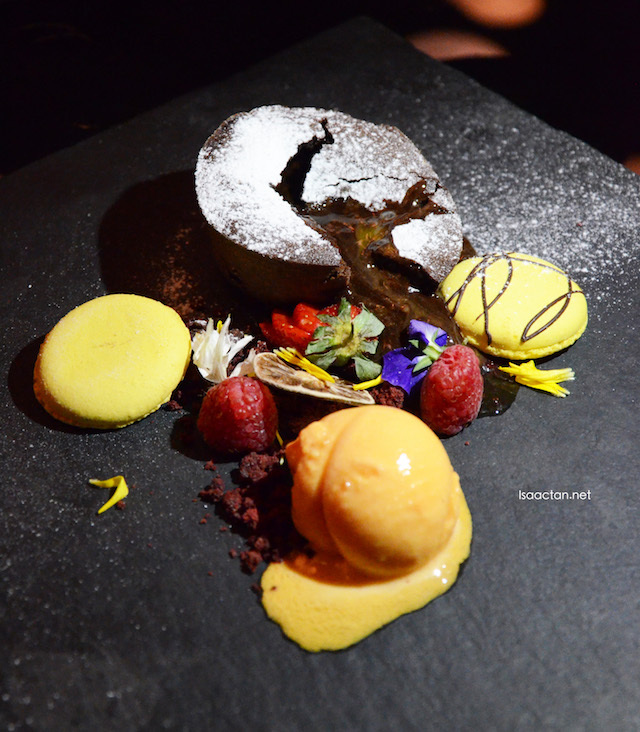 We ended our really satisfying meal over at Cedar On 15 @ Impiana KLCC Hotel with the beautiful Chocolate Molten Cake. Served with fresh raspberry and homemade Marzipan ice cream with a pretty setting, this dessert comes with the accompanying strawberry lime liquor. Drip it on, cut the cake open and watch that delicious chocolate flow out. 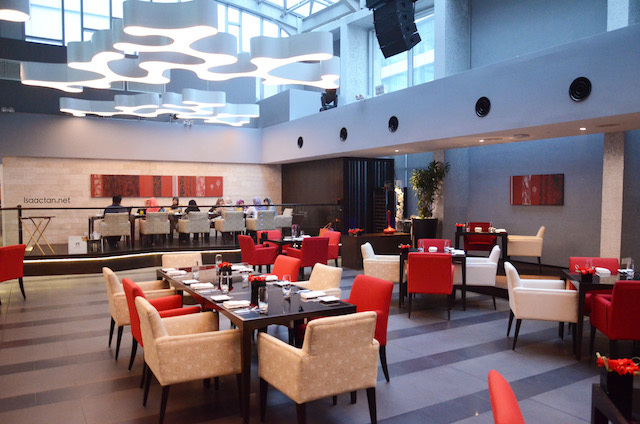 Do drop by Cedar On 15 if you're around the vicinity of KLCC and would like to get a fine meal with a beautiful KL view. Nice place, so spacious. Love the presentation. win liou lor youuuuuu... always get so much good food. That chocolate molten cake! Oh my god, i'm drooling now. Wondering if this place is halal? yummy food to eat with loved ones. Late night seeing this post makes me so hungry. Lucky I just had my supper hehe. I had dinner at Cedar on 15 before the food are decent and environment is great. The overflowing choc from Chocolate Molten Cake looks very tempting.